Scooby-Doo! : Happy Families takes four well known, and much loved, card games and brings them into the 21st century. The cards are also quite large, measuring 80mm x 120mm. The illustrations on each card are also of high quality. 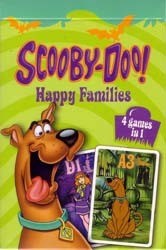 The image on the back of each card is of Scooby with his tongue hanging out (as illustrated on the pack shot above), while the front of each card depicts one of the Scooby gang in full glossy colour. In an age where kids are more likely to spend their evenings playing with their consoles than they are playing games that all the family can enjoy together Scooby-Doo! Happy Families is a must own addition for every household - and at under £5 it's a pretty cheap way to have hours of fun.